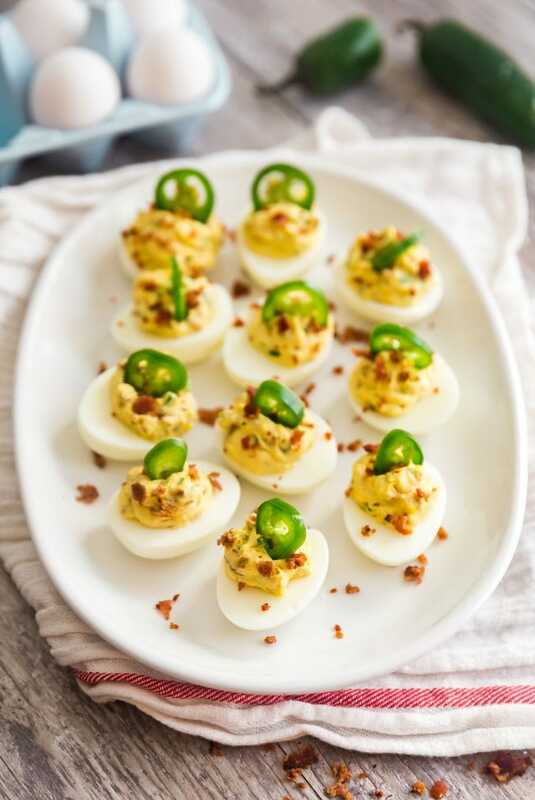 Spicy, savory and oh-so-good, these Jalapeno Popper Deviled Eggs will add a delicious kick to traditional deviled eggs that everyone loves! Deviled eggs are dangerous for me. I can never resist them. If I see a plate of them at a party, I find myself making my way back over that way one, two, three…dare I say even four times! I know. I’m embarrassed for me too. I should probably put it out there that I pretty much love eggs any way that I can get them. 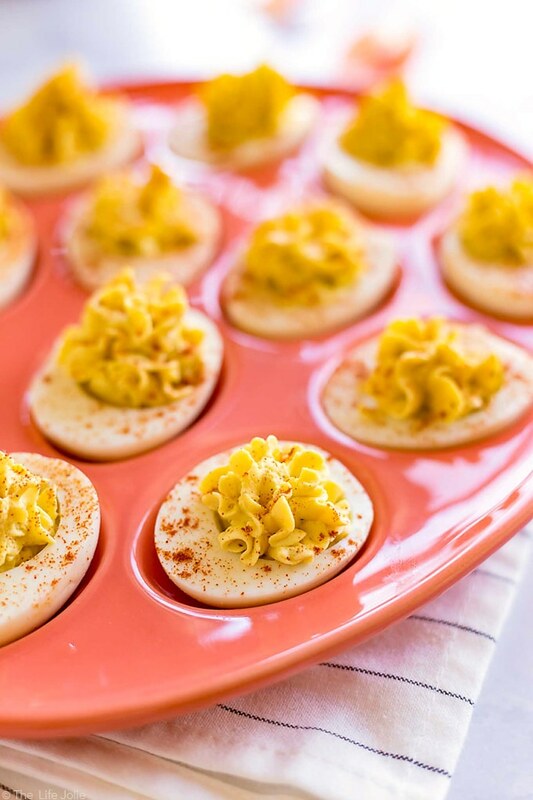 But there’s something especially fantastic about deviled eggs. Perhaps it’s all the extra flavor added in. And of course, the flavor possibilities are endless! 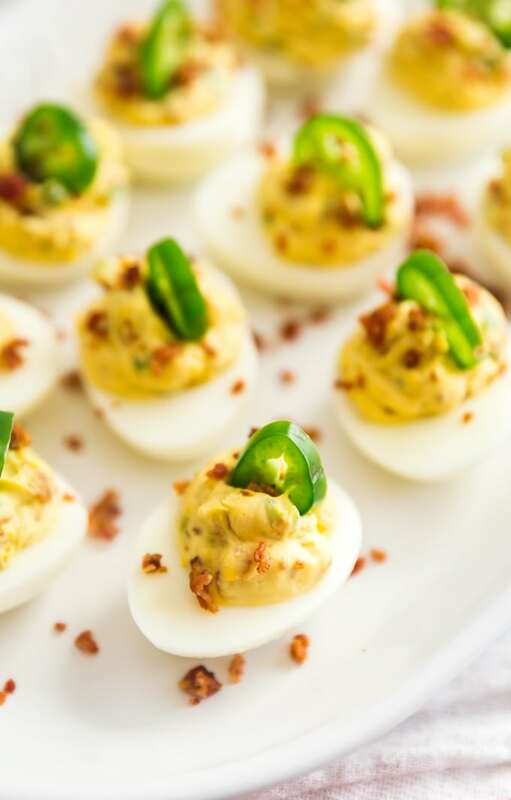 For these Jalapeno Popper Deviled Eggs, I was inspired by Jalapeno Poppers. 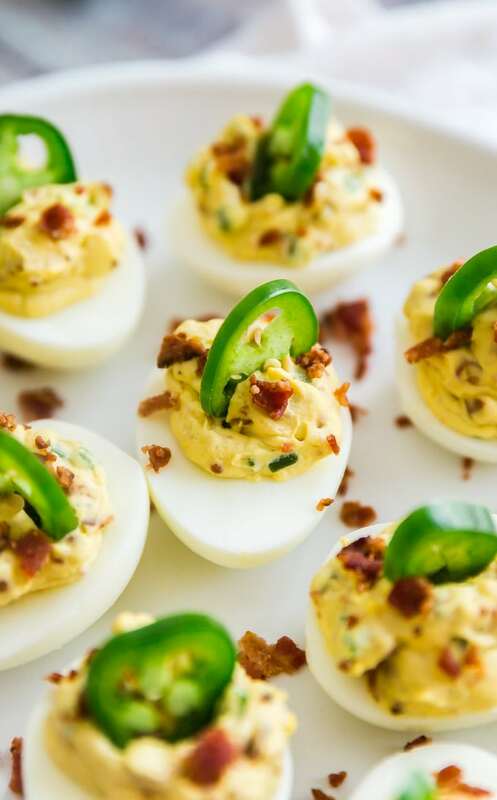 Always a popular party snack, poppers bring the perfect combo of smokiness from the bacon, spiciness from the peppers and decadent creaminess from the cheese. And with the creaminess of the egg yolks, it seemed like the perfect marriage of two of my favorite snacks! If you don’t want them too spicy, remove and dispose of the seeds before chopping. 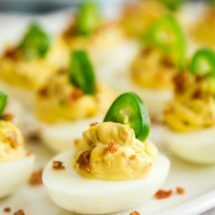 You can easily make boil the eggs and fry off the bacon ahead and then peel and make the actual deviled eggs before serving. These last a few days in the fridge in an airtight container, so get on those leftovers (if there are any)! The eggs peel easier if done under cold water. If you’re concerned about chopping the peppers (and getting that pepper residue on your hands which could easily burn your eyes if you rub them) use gloves. I left the salt and pepper to taste. Start with a very small amount and go from there- make sure you mix it super well each time. These Jalapeno Popper Deviled Eggs are an excellent option to bring to a party or tailgate. They’re a super fun option for using all those Easter Eggs in the spring. I would be super thrilled to show up at a brunch to find these on the menu! Bottom line, give ’em a shot! Cut the eggs in half, legnth-wise and remove the yolk from the egg halves into a mixing bowl. Take 1 Tablespoon of crumbled bacon and set aside (for topping). Add cream cheese, mayonnaise, apple cider vinegar, the minced jalapeno pepper,all of the bacon (except for the portion that was held aside) and salt and pepper to taste to the mixing bowl. Place the yolk mixture into a zipper bag and cut one of the corners off. "Pipe" the yolk mixture out of the corner of the bag into the holes in each egg (where the yolks used to be). 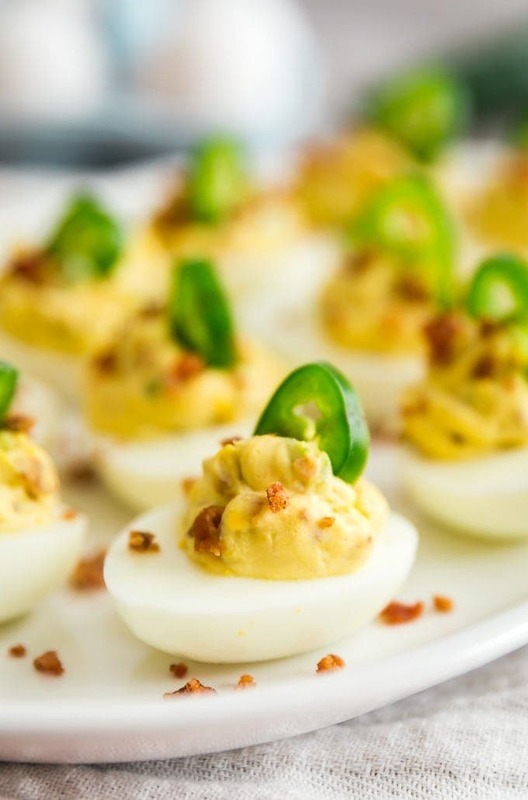 Place a slice of jalapeno pepper into each egg yolk mixture and and sprinkle with the remaining bacon crumbles. Refrigerate until you're ready to serve them. 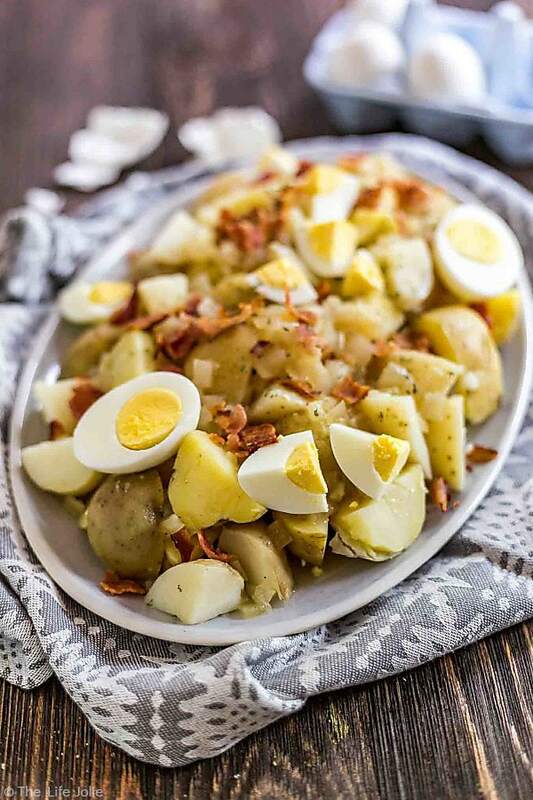 Try some of my other recipes featuring eggs! 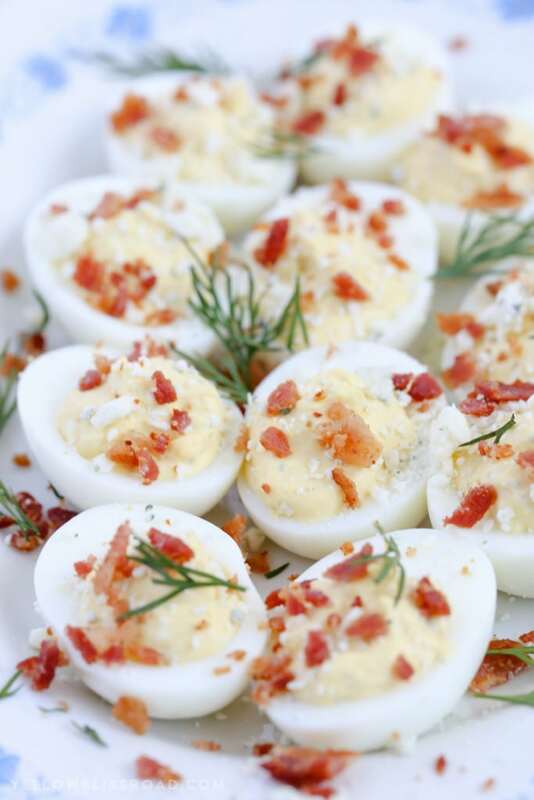 Want more delicious eggs recipes? 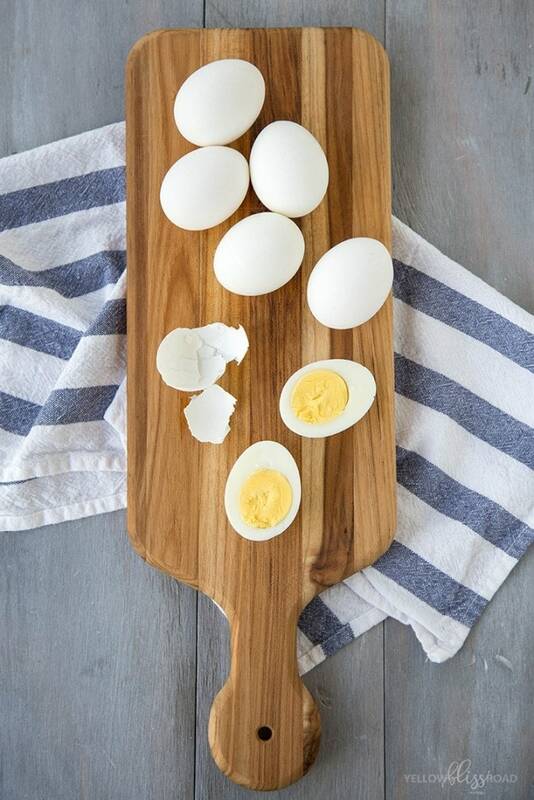 Hard Boiled Eggs – Perfect Every Time!